This Canon stainless steel outdoor wall up and down PIR sensor light is practical, stylish and rated IP44 making it weatherproof. When fitted on an exterior wall it will light the area above and below with a pool of light during the hours of darkness to help visitors find their way. Try GU10 LED lamps to reduce energy costs, or for a completely different light source coloured LED’s to wash your wall above and below with colour. Matching items available in this range, please scroll down to view. Hello Kim, this light is switched by the PIR and does not have an override facility. 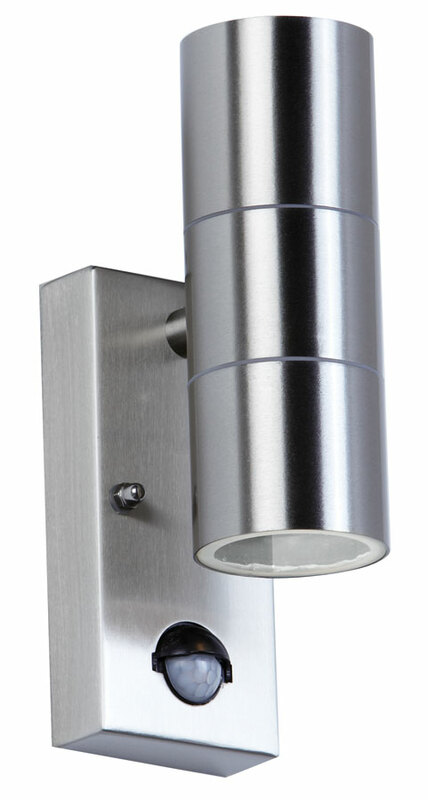 You can power the fitting by a separate switch but it will only illuminate the area when it detects movement.